The Best Sharepoint blogs from thousands of top Sharepoint blogs in our index using search and social metrics. Data will be refreshed once a week. Also check out Top SharePoint Youtube Channels list for Top videos on SharePoint. Sharepoint newsletter is a comprehensive summary of the day's most important blog posts and news articles from the best Sharepoint websites on the web, and delivered to your email inbox each morning. To subscribe, simply provide us with your email address. About Blog Supporting the SharePoint Community since 2009, /r/sharepoint is a diverse group of SharePoint Administrators, Architects, Developers, and Business users. All SharePoint on-premises and SharePoint Online questions are welcome. Facebook fans 1,191,854. Twitter followers 561,604. Europe About Blog The European SharePoint Community Resource Centre has a vast and growing library of SharePoint content for you to browse from. Facebook fans 2,115. Twitter followers 6,296. Ottawa, Ontario About Blog Greg Zelfond is SharePoint Consultant specializing in Document Management & Migration, out-of-the-box configuration for SharePoint & Office 365. United Kingdom About Blog Join over 12,000 SharePoint, Azure and Office 365 fans whilest you enjoy over 500 hours of premier (free) content presented by the world's most renowned experts. Facebook fans 1,736. Twitter followers 4,372. Penton About Blog SHAREPOINT PRO magazine helps admins, devs, and business tech people master SharePoint via web content, training, events. Facebook fans 2,009. Twitter followers 2,403. About Blog A Blog for Sharing My experiences as an Architect, Consultant, Administrator and Developer with SharePoint and its related products. Facebook fans 2,011. Twitter followers 328. About Blog Comprehensive up-to-date coverage for sharepoint, aggregated from news sources all over the world by Google News. Facebook fans 26,290,386. Twitter followers 225,356. Chicago About Blog TopSharePoint.com is a showcase gallery that features top quality, creative and unique SharePoint-based websites from around the world. Facebook fans 759. Twitter followers 3,073. Montreal,Canada About Blog A blog by SharePoint Server MVP Vlad Catrinescu, blogging about SharePoint 2010, 2013, 2016, Office 365, PowerShell as well as Microsoft Certifications. Facebook fans 1,016. Twitter followers 8,647. Alphen aan den Rijn, NL About Blog Waldek is a Microsoft Office Development MVP and Senior Developer at Rencore. He reinforces Rencore product development adding loads of business experience from working as a SharePoint consultant for more than 10 years. Facebook fans n/a. Twitter followers 7,825. Puslinch, ON About Blog Random musings and thoughts on SharePoint, Business Intelligence, Microsoft technology, and occasionally even diving from John White. Boston, MA, USA About Blog Marc is the Co-Founder and President of Sympraxis Consulting LLC, located in the Boston suburb of Newton, MA, USA. Sympraxis focuses on enabling collaboration throughout the enterprise using the SharePoint application platform. Facebook fans n/a. Twitter followers 11,941. London, England About Blog This blog focuses on the architecture/development aspects of working with SharePoint. Facebook fans n/a. Twitter followers 8,281. Sydney, Australia About Blog Cameron Dwyer is a founding architect and developer of the OnePlace Solutions suite of products which provide awesome integration between Office 365/SharePoint and the desktop. Facebook fans 35. Twitter followers 1,489. New York, NY About Blog LiveTiles software empowers staff with the ability to surface and integrate scattered business apps, resources, files and more on a single pane of glass over Office 365, SharePoint and Azure. Facebook fans 706. Twitter followers 2,190. About Blog The blog basically concentrates on SharePoint, Office 365 and Project Server. Coimbatore, India About Blog Hubfly provides SharePoint Intranet as a Service in its truest sense. We deploy enterprise intranets integrated with SharePoint and Microsoft Office 365. The business productivity apps we bundle helps run businesses more efficiently. Finally, an Intranet that you will use. Facebook fans 160. Twitter followers 172. McKinney, TX About Blog The blog articles highlight how using SharePoint and Office 365 solutions can help organizations address various business challenges, such as team collaboration, document, project and knowledge management, etc. Saint Johns, FL About Blog Andrew Connell is an entrepreneur & developer with an emphasis in Microsoft SharePoint & content management systems (CMS). Facebook fans n/a. Twitter followers 15,037. Charlotte, NC About Blog The latest information on business management, best practices, user tips, advanced administration and development for customer experience, digital transformation and the digital workplace, including Microsoft SharePoint, Dynamics CRM and Salesforce.com. Facebook fans 368. Twitter followers 754. Birmingham, Alabama About Blog Laura Rogers is SharePoint consultant, author and speaker, Microsoft MVP, complete SharePoint and Office 365 geek. Facebook fans 735. Twitter followers 17,601. About Blog To help you discover the analystics insights you need to engage your SharePoint/Office 365 users. Read about various SharePoint analytics topics including: Adoption, Productivity, Consumption, Migration, Engagement, Governance, Search and more. Facebook fans 1,604. Twitter followers 934. Vienna, Austria About Blog Stefan Bauer work as a design-minded developer & information architect and Office Development MVP based in Vienna / Austria. Facebook fans n/a. Twitter followers 2,938. Chicago, IL About Blog SharePoint and Office 365 related insights from Just-in-Time Learning solutions provider VisualSP. Facebook fans 20,091. Twitter followers 4,654. Bern, Switzerland About Blog Technical articles, tutorials and news about SharePoint and Office 365 for IT Pros written by Roger Haueter, Microsoft MVP on SharePoint Server. Facebook fans 1,076. Twitter followers 2,184. NRW, Germany About Blog This blog is all about SharePoint Technology. Facebook fans 77. Twitter followers 26. About Blog For a long time the title of this site mentioned all the Microsoft technology that I'm involved with. But the title SharePoint, CRM Dynamics, Project Server, Office 365, Skype for Business, OneDrive, PowerShell and Nintex didn't really catch it all as I get involved in more parts of the Microsoft products stack and related software. Chicago IL About Blog This blog is all about SharePoint, Office 365, Azure, and Front end JS geek. About Blog Tips from an other Admin on SharePoint. Coimbatore, India About Blog I am a full stack web developer with a focus on Office 365, Microsoft Azure, SharePoint, Microsoft's .NET Framework, Angular and Node.js. As a SharePoint Evangelist, my professional interests tend to be technical and SharePoint focused. I hope the posts in my blog will give back a little to the community that has helped me. Boston, MA About Blog BA Insight’s Software Portfolio makes it possible to connect SharePoint Online and SharePoint on-premise to enterprise systems so that you can implement intranets with internet-like search experiences. Facebook fans 98. Twitter followers 685. Järfälla Municipality About Blog Wictor Wilén is a Group Manager and SharePoint Architect working at Avanade. Wictor has achieved the Microsoft Certified Architect (MCA) - SharePoint 2010, Microsoft Certified Solutions Master (MCSM) - SharePoint and Microsoft Certified Master (MCM) - SharePoint 2010 certifications. He has also been awarded Microsoft Most Valuable Professional (MVP) since 2010. Facebook fans n/a. Twitter followers 9,245. About Blog Plumsail is an Independent Software Vendor concentrating on Tools, Web Parts and Add-Ins for Microsoft SharePoint range of products. Facebook fans 26. Twitter followers 130. Gatineau About Blog Nik Charlebois is a Microsoft Premier Field Engineer SharePoint & Office 365. Facebook fans n/a. Twitter followers 927. Finland About Blog Jussi Palo is a Senior Consultant, Partner at Sulava Oy, Co-Founder at Apped. He Answers to Microsoft Technology related questions, such as SharePoint, Office 365. About Blog Writing(though i hardly write these days), Traveling, Food [ 🙂 ], Music(just listening and attempting to sing), being with family. About Blog Check out Aerie's blog for the latest news and information on SharePoint & Office 365 expertise, and proven methods for business improvement. Facebook fans 57. Twitter followers 339. St Johns, FL About Blog Voitanos is your host for on-demand technical training and educational resources for Microsoft’s Office 365, Microsoft Azure and cloud related technologies. Whether you are looking to learn something new for a project, get up-to-speed on a new technology or level up your skill set, Voitanos is for you. Facebook fans 221. Twitter followers 379. Michigan, USA About Blog Waqas Sarwar SharePoint Blog is all about everything in SharePoint. About Blog Subscribe us to get articles on Sharepoint from Collabshow.com. Facebook fans n/a. Twitter followers 17,639. About Blog All about SharePoint branding & customizations. About Blog Some SharePoint tips and tricks. Breinigsville, PA About Blog Jerry Yasir is a Microsoft MVP for Office Servers ad Services and Office 365 Architect at Hewlett Packard Enterprise. Love SharePoint, Office 365 Azure & PS. Facebook fans n/a. Twitter followers 1,219. Indianapolis, IN About Blog Robert Bogue is Author, Speaker, Consultant, Crazy, MVP of SharePoint. About Blog Planet SharePoint is an aggregation of SharePoint related blogs and news. 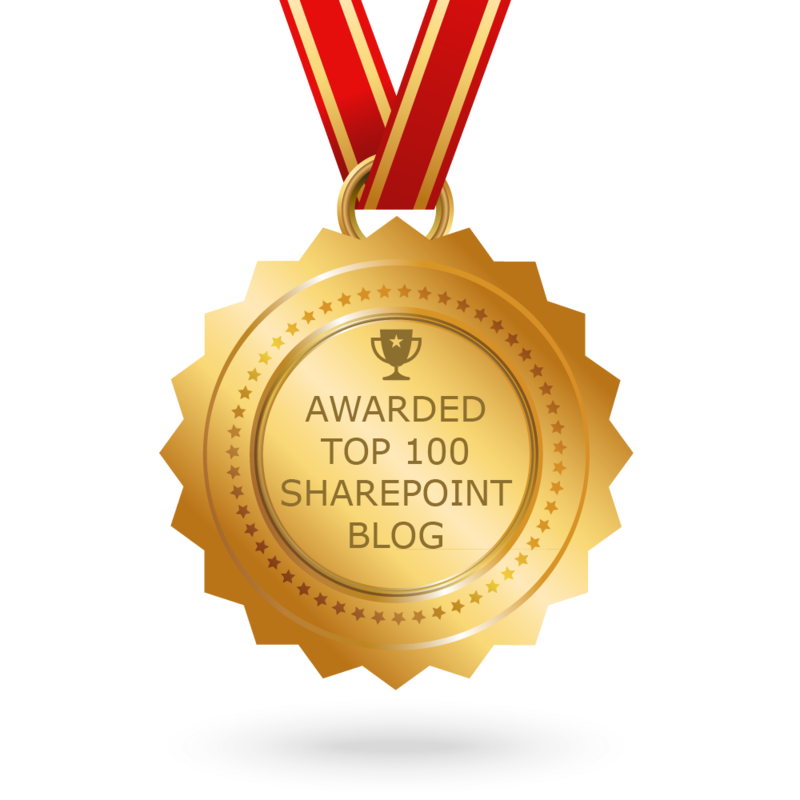 It acquaints those interested in the SharePoint Blogisphere with the best blogs out there. Facebook fans n/a. Twitter followers 5,419. Oregon, USA About Blog This blog is about SharePoint by Prashant Bansal . Newton Center, MA About Blog This blog is all about Musings and Solutions for SharePoint, O365, and Azure. About Blog Subscribe us to get updates about sharepoint articles from Gowtham Rajamanickam. London About Blog Notes on SharePoint from a developer and architects perspective. Facebook fans n/a. Twitter followers 418. Karlsruhe, Germany About Blog Anything about SharePoint and what's all around. Olaf Didszun is SharePoint specialist, system engineer, coach, trainer, solution architect, software developer. Issaquah, WA About Blog ShareKnowledge is a SharePoint Learning Management System (LMS) built on top of the Microsoft platform. Facebook fans 1,199. Twitter followers 88. South Yorkshire About Blog PointSolutions is a SharePoint Solutions Specialist based in the UK. They deliver SharePoint Collaboration, Applications and Services. About Blog Communication > Collaboration > Productivity. Dallas, TX and Nottingham, UK About Blog Eric Shupps is the founder and President of BinaryWave, a leading provider of enterprise software solutions for SharePoint. Eric has worked with SharePoint Products and Technologies since 2001 as a consultant, administrator, architect, developer and trainer. He is a director of the Dallas/Ft. Worth SharePoint Community group and participating member of user groups throughout the United Kingdom. Facebook fans n/a. Twitter followers 4,617. Antwerp About Blog Rick Van Rousselt is a SharePoint / Office 365 consultant living in Belgium. He is working with SharePoint since 2007 and recently made the transition to Office 365. Mumbai About Blog Dipti Chhatrapati is a SharePoint enthusiast and Ambitious consultant with experience in software development, design and administration. USA About Blog VirtoSoftware is a professional team who designs and builds innovative SharePoint web parts and Office 365 apps. Facebook fans 668. Twitter followers 1,119. Scotland ,United Kingdom About Blog Welcome to Geoff Evelyn's SharePoint blog, called SharePointGeoff. This blog is devoted to service, support and high-end administration for SharePoint solutions. This site houses many articles, resources and downloads concerning Sharepoint Planning, Design, Deployment, Implementation, Automation, Architecture, Business Continuity, Disaster Recovery, Software Development and Support. Loveland, OH About Blog Todd Baginski is a eleven-time Microsoft SharePoint Server MVP, O365 and SharePoint Top 25 Influencer, and Sitecore Certified Professional Developer whose blog focuses on Microsoft SharePoint, Office 365, Azure, Mobile, Office, and cloud technologies. Facebook fans n/a. Twitter followers 15,238. About Blog A blog about SharePoint development and SharePoint branding. Finding ways to make SharePoint even better. Johannesburg, South Africa About Blog Keeping SharePoint Real. Facebook fans 1,036. Twitter followers 432. About Blog Working almost exclusively as a SharePoint Developer/Consultant since 2005. I've been involved in a variety of projects for many clients in various industries. I've had the opportunity to work with all versions of SharePoint throughout my career. My work has taken me to projects in Virginia, DC, Maryland, New Jersey, New York, and my home, Philadelphia. About Blog A Knowledge Management blog, related to sharepoint and all the stuff which can blow your mind away. Dunkirk, France About Blog A technical and functional blog around Office 365 technologies, such as SharePoint Online, Dynamics 365, Azure and SharePoint On-Premise. CONGRATULATIONS to every blogger that has made this Top Sharepoint Blogs list! This is the most comprehensive list of best Sharepoint blogs on the internet and I’m honoured to have you as part of this! I personally give you a high-five and want to thank you for your contribution to this world.